Today I thought I'd start a new little series all about My Top 5! This will consist of makeup items mostly and will give you a mini review of each item and an insight into the makeup I love the most he he. 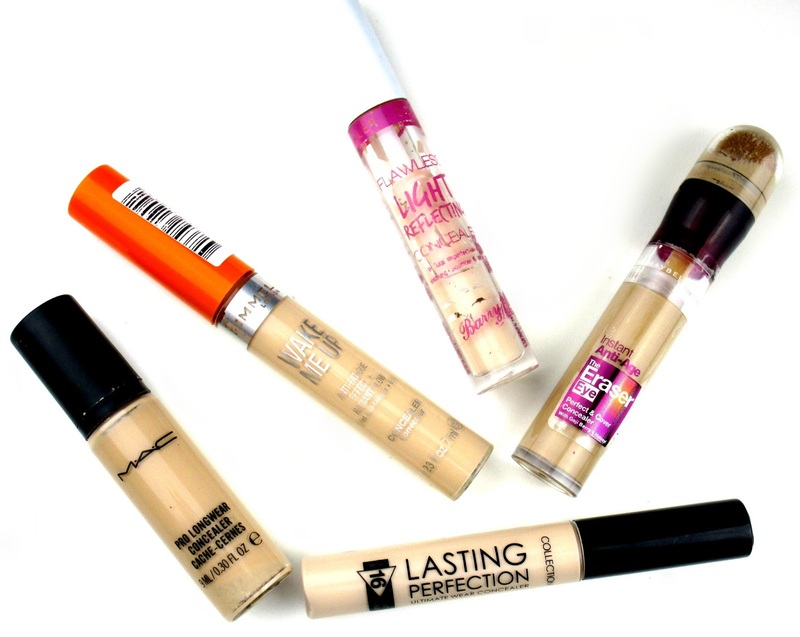 I thought I'd kick things off with something I wear everyday without fail, my beloved concealers! Firstly it's my trusty MAC Pro Long wear Concealer, I honestly couldn't be without this baby! The concealer itself has creamy, light weight liquid texture and a matte finish with a medium to high coverage that will cover dark circles, blemishes, scars, veins, redness and pretty much anything else that you throw at it, it's also extremely long-wearing and literally wont budge all day once its set, it's amazing! Yes it's pricey at £17.50 a pop but I think it's totally worth it and is by far one of the best concealers I've every tried. Next it had to be my Maybelline Eraser Eye Perfect and Cover Concealer, this was a no brainer for me because it's actually the second time I've repurchased the Eraser Eye and it's fair to say I blooming love it. The formula of the Eraser Eye Concealer is so light weight yet hydrating and creamy at the same time, it's enriched with Goji Berry which helps care for the eye area by hydrating, and it also contains Haloxyl which reduces the look of puffiness and shadows whilst also fading the appearance of under-eye dark circles, it's amazing! Coverage wise... I'd say it's a medium plus, as I said before it does a great job at covering up my dreaded dark circles and the Light shade works amazingly well at brightening up and highlighting my under eye area too. Then it's the ever so popular Collection Lasting Perfection Concealer, this is my most repurchased concealer that I've been buying for years, even when Collection where called Collection 2000 ha ha. This little beauty has a gorgeous creamy texture that blends out beautifully and provides a medium plus to full coverage without looking cakey, it covers my blemishes, redness and dark under eye circles with ease and lasts all day without and need to touch up, in a word its 'brillaint'! Missed out on your eight hours of beauty sleep? Need a serious pick me up? Then Rimmel's Wake Me Up Concealer will be the one for you. Wake Me Up provides a medium coverage that will have your under eye area looking instantly brighter, more awake and fresh looking. So if your looking for something slightly lighter but still does a great job in the mornings then give Wake Me Up a whirl. Lastly is Barry M's Flawless Light Reflecting Concealer, this is actually very similar to Rimmel's Wake Me Up but I just had to feature it because again I've repurchased this a lot on occasions when I couldn't get my hands on Collections Lasting Perfection. This little stunner by Barry M is creamy, has a easy to blend texture, has an illuminating medium coverage so it covers well and brightens and I love the addition of Cucumber and Aloe because together they soothe, cool and comfort the eye area which ideal if you wake up with puffy eyes. What's your favourite concealer beaut's? I'd love to know! I've heard about the collection concealers everywhere!But, I've been so wary of buying one as i'm afraid it'll go cakey! i've sworn by the collection concealer since i was about 14 years old! i'd love to branch out though and try the rimmel wake me up concealer! When it comes to Concealers, Benefit's Erase Paste is my absolute favourite, especially when it comes to covering dark circles! My dark circles are extremely bad most days and this gem is the only concealer that keeps them hidden away nearly, haha. I've been dying to get my hands on Eraser Eye but can't seem to find it in any local shops, think I'll just order online! The collection concealer is literally my holy grail, I really loved the Seventeen one recently after trying it but always go back to collection! Couldn't get along with Rimmel Wake Me Up but I do want to give it the benefit of the doubt and try again! The Magic Eye-Eraser is my go-to concealer. LOVE IT! I love the Benefit Boi-ing Concealer but really fancy trying either the MAC one or the NARS creamy concealer..